A SaaS platform that provides in-depth survey solution for academics, MNCs, non-profits, government and private sectors, consultants and enterprise clients. With SmartSurvey, you can easily create survey questionnaires, reach out to the potential customers, and analyze their valuable feedbacks that uncover valuable business insights. It allows to distribute invitations through SMS and email. You can also embed surveys in web pages and share them across social media platforms. Its built-in analytical tools let you view real-time survey reports and allow to export data to do further analysis. Keep your data safe and secure in one place by connecting to APIs,Google Analytics, Zapier & more. How much does SmartSurvey cost ? The pricing for SmartSurvey starts at $30.0 per month. SmartSurvey has 2 different plans such as - Pro Plan at $30.0 per month and Business Plan at $60.0 per month. 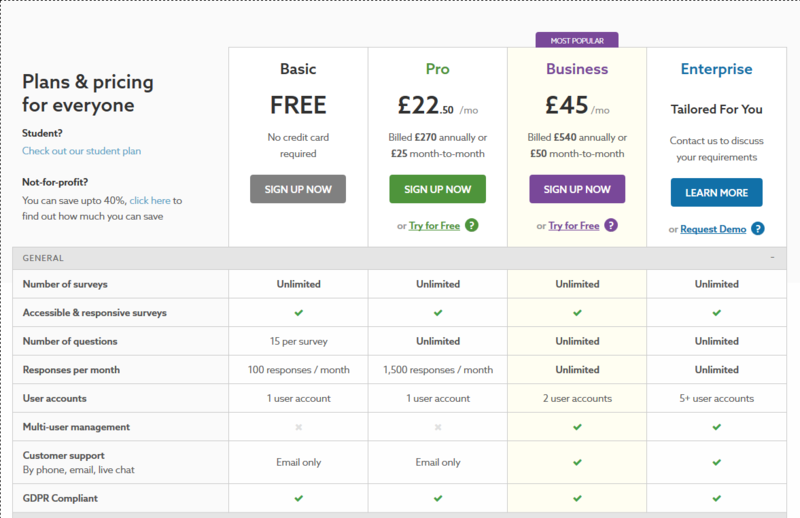 SmartSurvey offers a Free Plan with limited features. They also offer an Enterprise Plan for their product. 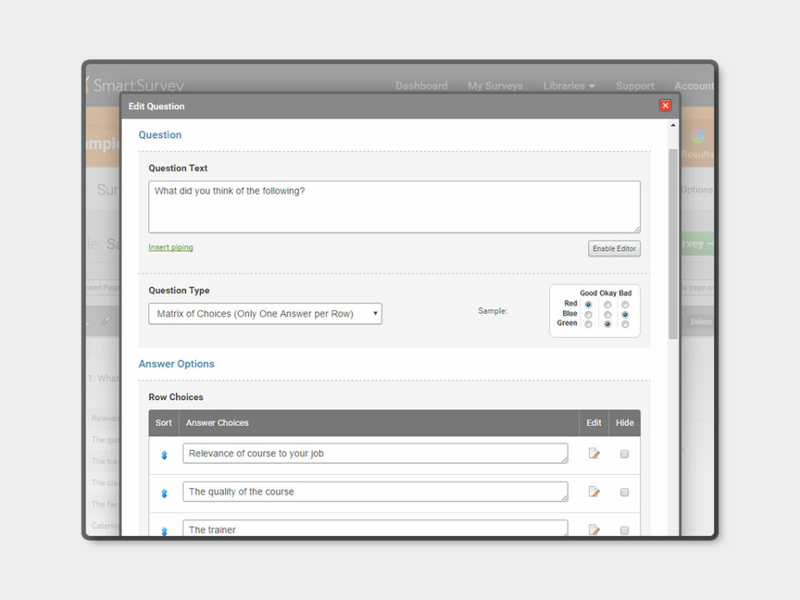 Email tool Send surveys via email, track open rates, views, and opt-outs. Pros: - The interface is so intuitive to use, it took my minutes to set up a survey form for my undergraduate charity research project. Cons: Nothing - it is awesome and does exactly what survey software should do. Pros: Ease of use - you can set up surveys quickly and easily and also view results in anyway you prefer. Cons: I have yet to find anything I don't like. Overall: I write lots of stories for our Alumni Community. I use SmartSurvey to set up typical Q&A for people to fill out so rather than emailing people the questions every time I simply direct them to the Smart Survey URL (which you can customise). Pros: When you buy something online. A lot of the time you are asked to make a survey after. Half the time for me it is with smart survey. It always seems to work fine for me. Short and to the point. Cons: Nothing to not like. It works and if you do not want to do it just close it. Pros: I liked how the surveys set up differently from other programs but was not completely foreign. Cons: There is not much not to like. The surveys are quick to set up and easy get results. Pros: I use this software when I need to send out short surveys to our committee members. It took me a bit to get the hang out creating the survey, but other than that it's been great. Cons: It took me a but to figure it out. That might be a user error on my part, nothing wrong with the software. Overall: If you're needing to survey a group of people, this is a fantastic way to do so. Easy breezy. Thank you for taking the time to review our software! We are really pleased to hear that it has been effective for you when distributing your surveys to a group of people. We are interested to hear a bit more about how you found its ease of use, and which parts you found not to be clear so that we can make strides to improve these for any future use. 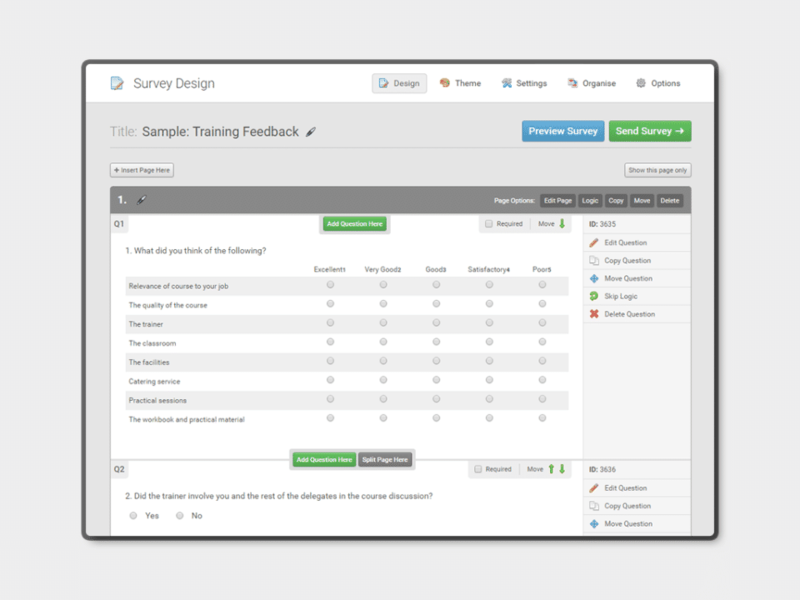 Pros: Intuitive survey design and very simple editing. Good reporting. User-friendly and easy to navigate. Paid options are pretty affordable. Cons: Free option doesn't give you custom branding. It definitely takes time to figure out all of the features. Pros: It was easy to navigate as a user. I don't have any experience at the other end of those seeking information. Cons: I did not have any cons as a user. Screen was a good size, easy to read and easy to flip through pages. Length was determined by those seeking information and sometimes this was long. Overall: Giving information I thought was important to the organization asking for the input. SmartSurvey does not meet design requirements. SmartSurvey is a platform that does have very good functions to be considered one of the best in the market of surveys, however, it should be stressed that this platform is very good to maintain opinions with a better status. SmartSurvey does not fulfill what it promises, because when you go to the registration page, the design is very nice, but when you finish the registration, they send you to a page where nothing that was previously seen is like that, since they give a design horrible with colors that do not attract attention. "Perfect reliable platform for opinions." 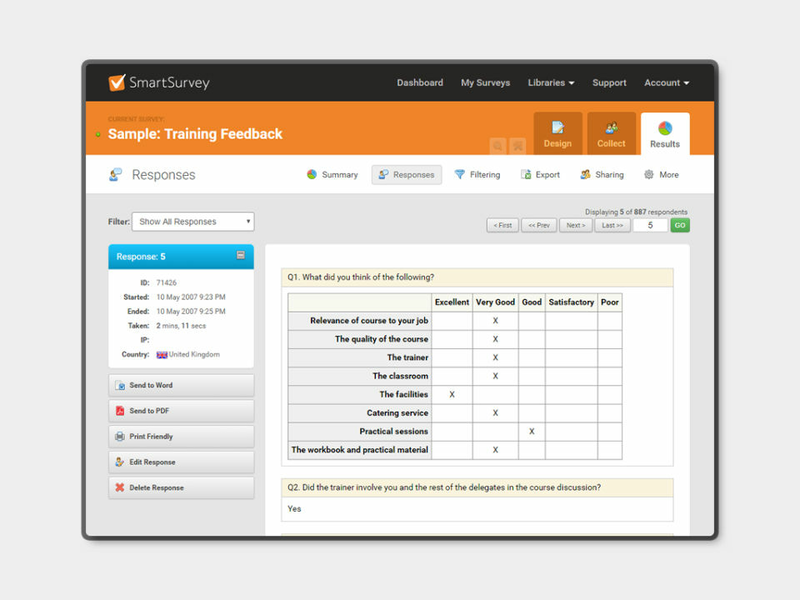 The best thing that SmartSurvey has, is mainly in the interface, it is a very nice design and it gives diversity to the user, it makes him feel more comfortable and the user experience he can have increases a lot. Also, this is a very good platform to be able to control a large volume of surveys, and be able to attend diverse opinions at the same moment. I have no complaints about SmartSurvey, since it has been a platform focused on offering the best user experience, and also, it is providing very good features that complement each survey. 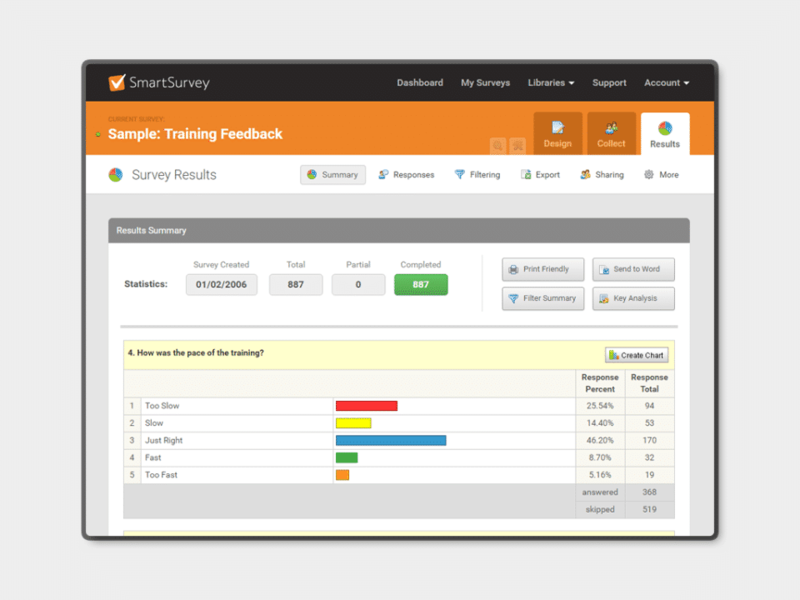 SmartSurvey is a really reliable platform, offers the best user experience, and also, extremely low prices. It is a platform capable of achieving 100% effectiveness around opinions. With SmartSurvey I have been able to handle a higher volume of opinions. Also, I have been able to offer surveys with better quality for my colleagues and my clients, respectively I think that the experience I have had has been really favorable, and the real opinion that I receive from each person, are of immediate quality. The best that SmartSurvey offers is its interface, nothing more comfortable than having an interface with such a clean and modern design that never presents a boredom, on the contrary, it provides the best quality of surveys thanks to the proportional design that gives users , I would never tire of using SmartSurvey, its design is so beautiful that it encourages me to do surveys on this platform. I have no complaints of SmartSurvey, since since I use it, it has given me excellent results and has fulfilled perfectly what I have been promised, immediate quality in each survey. SmartSurvey is a very easy to use platform, and it will always give you positive results, and reach the highest point to give you the best opinions of the market, provide you with the best quality day after day in 100%. With SmartSurvey I have managed to have a better quality of surveys with my colleagues and my clients, in this way, it has also managed to perfect as such the area of ​​the surveys, managing to give us better opinions with a group of qualified people to give the best opinion about our products and services and make us improve day by day.